In late August 1984, I stood on a narrow catwalk 40 feet above the ground and scanned the surrounding mountains with a pair of Navy surplus binoculars. I was Middle Sister lookout,, perched at 6967 feet above sea level. I looked down into the steep canyon of the St. Joe River in the Idaho Panhandle, east to Montana, south to the Clearwater country and on the edge of my vision to the west were the golden hills of the Palouse. It was fifty miles to the so-called town of Avery, two hours on unpaved roads. My contact with the world was a heavy two-way radio filled with D-cells, the boom box that picked up stations in Spokane and Missoula, and the afternoon fly-by of the observer plane out of Coeur d’Alene. My job was to watch for any wisp of smoke emerging from the timber, pinpoint it on a map, and radio it in. I had lots of time to read, write, draw, knit, run up and down the stairs, study the firefinder to learn the name of every creek and peak. I washed the windows, scrubbed the floor. And I watched. I watched the sun move across the steep forested mountains until I knew how the light hit each ridge at certain times of day. I identified pockets of haze, and dust from road building and logging. I watched clouds move from west to east, thunderheads grow with lightning flashing around inside them, and colorful sunsets. I watched an owl circle my tower three times at dusk, watched mountain goats and deer, chipmunks and every kind of insect. I watched the wind move the stiff branches of subalpine firs on the ridge that went over to West Sister. The wind was a near-constant presence on the mountaintop. It sang in the guy wires and hummed over the radio antennas. It wove through the legs and timbers of the lookout, rattled the shutters that lifted up over the windows like the bill of a cap. That day in late August, the wind changed. When the Coeur d’Alene dispatcher read the morning weather over the radio, she said lookouts to the north were reporting winds of 50 miles an hour. The rest of the forest could expect the same as a cold front passed. Well, I thought, I’m ready. Let’s see what it does. It came, a dark cloud from the southwest. I thought it was rain, but it was dust. The lookout anemometer held a steady 40 miles an hour, and the tower rocked. Gusts hit the tower at 70 miles an hour. I could barely hear the radio as small lightning fires came to life down in the woods. It blew all night. I thought the shutters would be torn loose and sent through the windows. I didn’t want to leave, afraid of being blown off the catwalk. Anyway, there was no place to go. I hunkered on the floor with all my clothes on (it was cold) and dozed. When light came, the wind was down to 25 miles an hour. Because the woods weren’t dangerous-dry, all the fires stayed small and had been contained. It was the same kind of wind that blew on August 20, 1910, when the woods were dry. They called it a Palouser. When I moved to Avery to work on the Idaho Panhandle National Forest, I learned about the 1910 fire. There was a room next to the post office in the old train depot that had pictures. Pictures of rangers cruising down burned timber, pictures of some of the items found on the bodies of firefighters overrun by flames in Setzer Creek. It was said that one of the apartments in town had been used as a morgue. And the woods where I worked still bore the marks of the fire. South-facing slopes burned so hot that there were still no trees growing on them after 70 years. Vast stands of lodgepole pine that sprouted after the fire. Big silver snags–larch, cedar, white pine–still standing. I met Norgy Asleson, a Forest Service employee with a passion for history. He and a friend had written a book about Avery’s early days (it’s called Up the Swiftwater), and had interviewed some of the old timers. He knew more about the fire than anyone, and would tell stories, especially when we were out in the woods. The wind that day blew numerous small fires into big ones which eventually joined and burned three million acres across three states. Timothy Egan tells the story in his new book The Big Burn: Teddy Roosevelt and the Fire That Saved America. The Forest Service was five years old at the time, and on the verge of being snuffed out by political enemies of Roosevelt and his friend Gifford Pinchot, the first chief of the Forest Service. The two men were seen as traitors to their wealthy class, because they worked to set aside large tracts of land in the West for the public. Conservation was a radical idea, and flew in the face of powerful men who had built empires by extracting resources and building railroads. They believed that the country would be better off if the land was managed by large private interests. These men were rich beyond belief, rich enough to buy Senate seats. Roosevelt and Pinchot on the other hand, wanted the land to be available for all Americans; for grazing, small-scale logging, watershed protection, and to be able to gaze out on wildness. The National Forest idea was partially sold on the notion that trained foresters would be able to protect public resources from devastating wildfires. The first part of Egan’s book explains this political history, and the friendship between the president and one of the first foresters in the U.S. Pinchot was trained in Europe–ironically,, his grandfather had made a fortune clearcuttiing the forests of Pennsylvania. 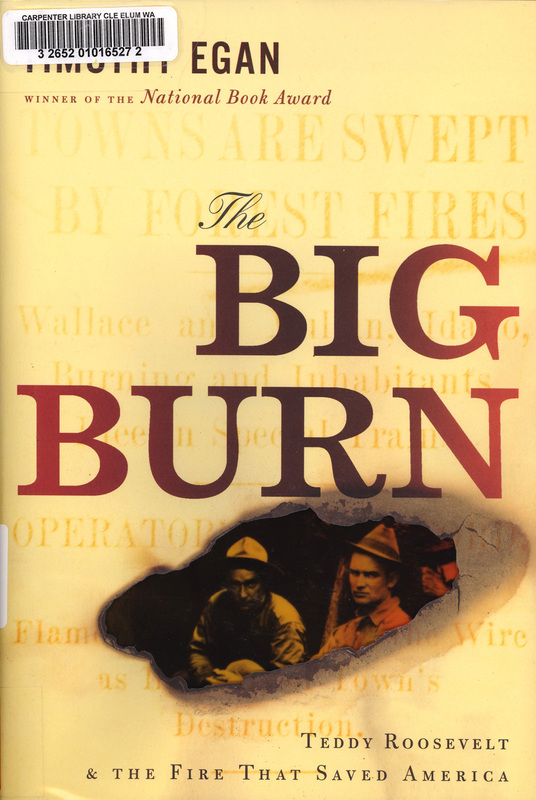 The second part of the book tells the story of the fire. True heroes emerge: Ed Pulaski, who held his panicked crew in a mine shaft at gunpoint; Joe Halm, who kept his crew together during the blow-up and brought them all out from the headwaters of the St. Joe; Buffalo Soldiers who helped with firefighting and the evacuation of the towns; railroad engineers who took trains over burning trestles and through smoky tunnels. Human nature is revealed during times of crisis. There was panic, mulish stupidity, and plain misfortune, as well as bravery. The third part of the book deals with the aftermath. What happened to some of the characters we had gotten to know. What happened to the forests. How Forest Service fire policy was shaped. The fire didn’t save America–that part of the title is hyperbole intended to sell books–but it likely saved the Forest Service. The fledgling agency now had a mission. For better or worse, the FS became the Fire Service and Smokey Bear’s message is deeply ingrained into the American consciousness. That’s why I was on Middle Sister Peak in 1984. Egan spent time with the original material about the fire, reading first hand accounts and diving into agency archives in Missoula. This is the tautest writing in the book, where he just reports and synthesizes source material. When he stretches into conjecture and criticism, he gets a bit heavy-handed. The metaphors clunk. Egan makes Congress, government bureaucrats, and the robber barons out to be the villains of the story (which works just fine for me). A hundred years later, the Forest Service still exists and fires still burn in the woods. The centennial of the 1910 fire is a thought-provoking time. After all we have learned, how do we want to live with fire? Egan reflects on that in a subtle way, then leaves it to the reader to continue thinking. In all, a worthwhile read. My interest in fire history was sparked (pardon the pun) by the 1910 fire. This book refreshes that interest. I have the idea to go back to Avery next summer to walk in those Idaho woods again. Great review! This is worthy of publication in a magazine or newspaper. You have just crammed a whole lot of heretofore unknown stuff into this old head, new friend… thanks! !